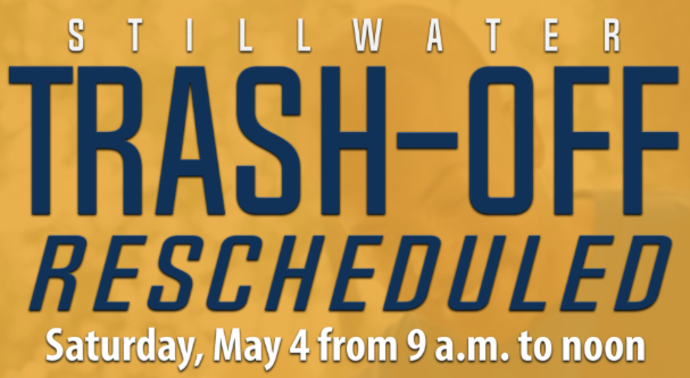 (STILLWATER, Oklahoma / April 8, 2019) – The City of Stillwater’s annual Trash-Off event has been rescheduled for Saturday, May 4 from 9 a.m. to noon. Volunteers should meet at the Armory Recreation Center, 315 E. 9th Ave., at 9 a.m. Residents are encouraged to sign up. Volunteers should RSVP with the number in their party to make preparations for each group. Individuals are also welcome to participate. An award will be presented to the group that collects the most trash and hot dogs and drinks will be served to participants at noon.